I've never had a problem with waiting in airports or being stuck indoors on rainy weekends. Why? Because they're the best time to read. I'm the type of girl who got bookmarks as birthday presents and who was known to finish chunky Harry Potter books within a day of their release. But then life got busy. My weekends on the couch with my Kindle slowly became distant memories. Then I discovered a book club, which has beckoned me back to the bookstore and introduced me to some of the best inspiring books I've curled up with so far. The club aims to read "life changing books" and while it's difficult to say if my life has truly been changed, the reading list has definitely poked and challenged my brain. While I'm still definitely a sci-fi and fantasy kid at heart, there are so many wonderful, insightful and inspiring books in other genres that have changed how I view myself and others. These books and the monthly discussions have encouraged me to explore new authors and topics and consider different views on this thing we call life. They beckon you to get out there and just be yourself. Looking to expand your mind and give yourself a kick start? 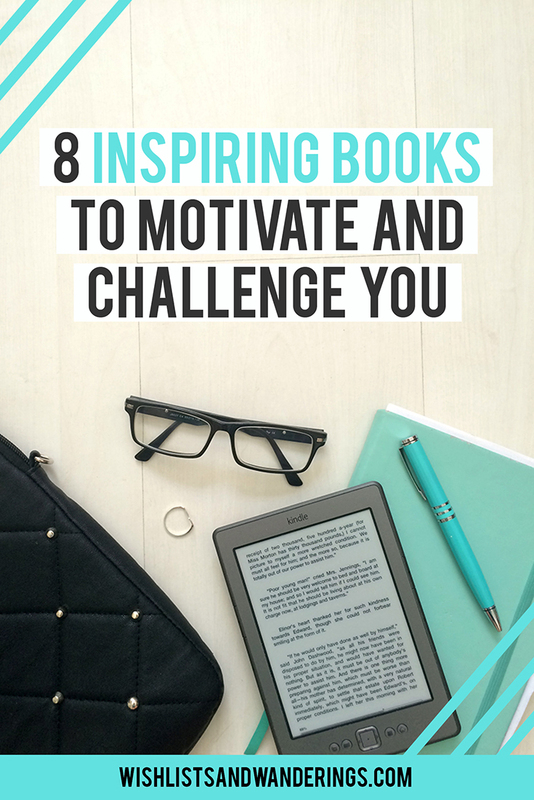 Here is my (current) list of some of the best inspiring books to motivate and challenge you. What it's about: Steven Pressfield's mini book aims to help you fight your delaying tendencies and push yourself to get the job done. Why it's inspiring: Chances are, if you are willing to read a book about doing the work rather than actually doing the work, every page will resonate with you. Pressfield gives interesting insights about the nature of resistance and other forces that can hamper us. He explains why we delay and avoid doing things that will bring us longer-term growth, health and self-fulfillment, and how we can do better. It's short, powerful, and offers no mercy. What it's about: Cheryl Strayed writes about the solo hike that changed her life. Why it's inspiring: If you ever need a reminder of how lucky you are, read this and be grateful you are not an ill-prepared hiker in the middle of nowhere dodging snakes and snow while trying to figure out your life. Strayed pretty much hit rock bottom - but she picked herself up and kept going. It's a remarkable story of persistence, which demonstrates how bumps and detours sometimes work out for the best in the end. The kindness Strayed was shown (often by complete strangers) on her journey is also a subtle reminder of the good in the world. What it's about: Rolf Potts' shares mountains of tips in this popular guide to travelling the world. Why it's inspiring: Newbie travellers and frequent fliers alike can pick up ideas from this mega guide. Potts projects a very specific view of travel (and touches on the traveller vs tourist debate that still ranges around the internet), but it's a helpful read even if you don't want to necessarily backpack across the planet. Alongside the lists of resources and useful tips are musings on solo (female) travel, immersing oneself in a new culture and the value of travel. If you've always wanted to pack your bags and go, this book will show you that you can do it - it's not as expensive / crazy / difficult as you may think. What it's about: Malala Yousafzai's autobiography chronicles her life in a rural Pakistani village, where she was shot for going to school, and her continuing fight for education. Why it's inspiring: The story of a Noble Peace Prize winning teenager who survived an assassination attempt is incredible in itself, but Yousafzai and her co-author also did a masterful job explaining the importance of the fight. Yousafzai's story highlights the joy that can be found simply by being home, the importance of family, and her view of the world. Her intelligence, strong principles and hopes for a better future are laced throughout the book, and the story shows how much impact a single human can have. What it's about: Susan Cain shares research and insights into how Western society grew to favour extroverts, and why introverts have an important role to play in the world. Why it's inspiring: This is a great read if you're a bit on the quiet side and have felt out of place in a loud world. It will show you that you're not alone, and that your personality traits can be an asset in the business world and beyond. If you're not an introvert, it can help you understand a significant portion of the population, and how to support and encourage them. What it's about: Writer Gretchen Rubin takes on a year-long project to see if she can make herself happier, without leaving the bounds of normal life. Why it's inspiring: This book offers practical examples of steps you can take to attain everyday happiness. While you may consider yourself generally happy, it's likely that sometimes, you'd like to feel more grateful or joyful, or less dissatisfied. Rubin's project gives you ideas for the small changes you can make to brighten your life, without having to quit your job and move to a remote mountain to find inner peace. It was interesting to see how relatively minor changes, like cleaning a cupboard or acknowledging the feelings of others, can have such a profound effect. Rubin's "splendid truths" were very insightful points, covering aspects like the importance of feeling like you're growing and moving forward in life, and how your attitude and smallest actions can impact the lives of those around you in a major way. What it's about: Paulo Coelho's novel covers the adventures of a young boy, who travels across Northern Africa in search of his treasure. Why it's inspiring: Dreams, destiny and Personal Legends - does it get more potent than that? The book is famous for the idea that "when you want something, all the universe conspires in helping you to achieve it." While you may not believe in all that mystical stuff, there are also great points about living in the present, the futile nature of worry and the importance of overcoming your fears. What it's about: Jenny Lawson writes about her attempts to be "furiously happy" in the face of mental illness. Why it's inspiring: While it can be a dark subject, Lawson gives you a different perspective on people who live with depression, anxiety and personality disorders. Her writing is incredible - so intricate and smart, but also ridiculously funny (although the taxidermied animals were a bit too much for me). It's sometimes uncomfortable to read, but it is a potent book to pick up if you're trying to understand a family member or friend's battle. It's also a testament to the importance of pushing through the darkness to reach the light. What's on your list of inspiring books? Let me know in the comments!